December has arrived! I always love these last few weeks of school before the winter break because students are already celebrating the holidays! Decorations are hung, and festive spirits are in tow! We are looking forward to our Winter Concerts, Hot Chocolate and Ugly Sweater parade, and so much more to celebrate the holidays. The Family Traditions curriculum in the Preschool is such an inspiration. I love seeing our families share their cultures and traditions with our students. I hope that you had the opportunity to see our incredible Upper School Thespians on stage this weekend, in their debut performances of "The Drowsy Chaperone." What a talented bunch of students and faculty we have that prepared this incredible production for us! Special thanks to Ken Sarkis and Paul Kay for their time and talents getting these kids ready. If you missed it, there are still a few shows left this coming weekend. You can buy tickets online at www.pvs.org/tickets. Come join us! Join us tomorrow December 4th from 4 pm to 7 pm at Leeds & Son on El Paseo. Dr. Brasfield invites you to Shop, Sip & Mingle. Complete your holiday wish list while benefiting Palm Valley School! RSVP to Christine at cstein@leedsandson.com. Attendance is free, food and drink are included, but an RSVP is required. Leeds and Son will donate a portion of all sales to Palm Valley School! Thank you to everyone who has generously given to our Annual Fund this year so far! Your generosity is incredible. We still see gifts come in every day and each one of them helps us inch closer to our goal of 100% parent participation this year! Also, we are reviving the Class Competition for participation. 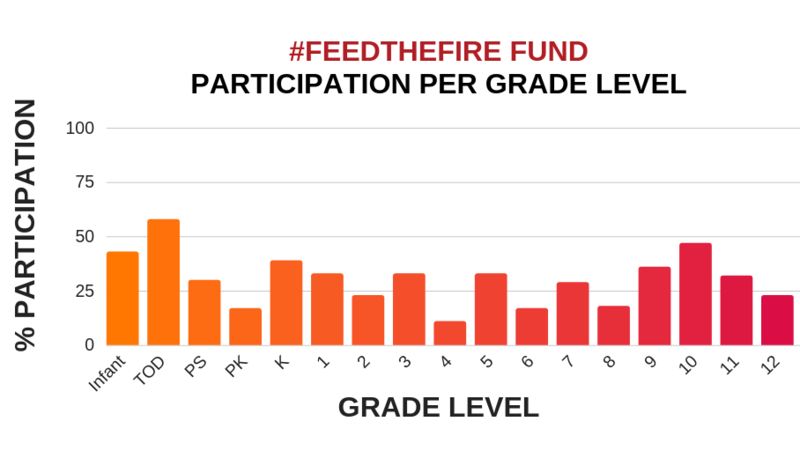 The grade level classes who reach 100% participation in the #FeedTheFire Annual Fund this year will be invited (students and their families) to a special Friday afternoon Ice Cream Social put on by Ben and Jerry's in January to say thanks and to celebrate! So far, our class breakdown for participation is below. Let's see who is the first to reach that 100% mark! One of the programs at Palm Valley that I am very proud of is our buddy program. Although this is a new program this year, it has already been inspiring in so many ways. Every event or meeting that we plan for our buddies to be together is so gratifying to see and to experience. Our older students take such pride and care in mentoring and watching over their younger buddy, and our younger buddies enjoy having someone to look up to, learn from, and to teach, too! I was so moved when a recent posting on our Facebook page about a college acceptance for one of our seniors prompted a comment from that student's younger buddy's Mother, congratulating him and thanking him for mentoring her child. When I see those connections being made with our parents and families across divisions and spanning more than a decade of years between their students - it's incredibly inspiring and heartwarming. It reminds me that the Palm Valley School is not just an exceptional learning community, but we are also an incredibly warm and supportive family community that nurtures one another to succeed. We value and encourage the sense of belonging and togetherness in powerful ways! I am grateful for the opportunity to experience these connections first hand with families, and to witness them daily in your interactions, words, and deeds with and to each other. Thank you for being here, and for all you do. I am thankful for how you continue to connect our community in new ways, and stronger forms! It's good to be a Firebird!